In the lead-up to the release of Dying Light’s new expansion, The Following, developer Techland has launched a very unique campaign involving Twitter to reveal the DLC’s map. Here’s how it works: when people tweet at @DyingLightGame using the hashtag #TweetForSpeed, a “specially modified” slot car will zip around a track, in the process clearing away the fog from the map and revealing its content. The further the car goes, the more of the map will be revealed. “The idea came from the current trend of connecting anything and everything to the Internet,” Dying Light community manager Michal Napora said in a statement. 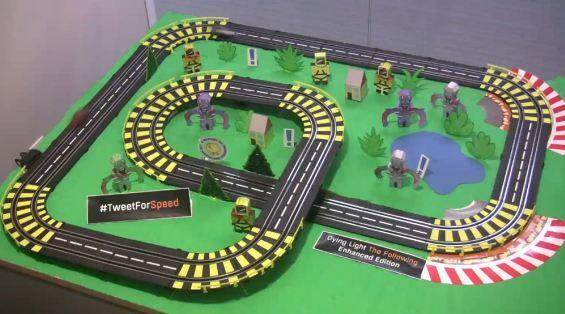 The “TweetForSpeed” campaign will play out in real time, broadcast live on Twitch. As you can see, not a lot of progress has been made so far, but it’s only just started. Dying Light’s The Following expansion launches February 9 across PC, Xbox One, and PlayStation 4, which is the same date that Dying Light’s Enhanced Edition arrives. You can buy The Following by itself for $20 (Techland recently raised the price to reflect its scope) or through the $30 Dying Light DLC pass. It is also available as part of the Dying Light Enhanced Edition. GameSpot recently played The Following. You can see new footage and hear our thoughts in this video.